Do you look in the mirror and think, “is there any hope for my skin?” Sun, stress, and aging surely take their toll, and over-the-counter creams and facials often deliver nothing but a smaller bank account. But you don’t have to accept imperfections like fine lines, acne, enlarged pores, and dark spots. If you’ve felt underwhelmed by the results of facials in the past, HydraFacial MD® may just change your mind. More than just a “feel-good” facial (although it can feel quite good), the HydraFacial uses a gentle yet powerful water-based Vortex™ system to not only cleanse and exfoliate your skin, but also infuse a customized serum complex to help repair damage, encourage healthy collagen production, and achieve a calmer, more balanced skin tone. HydraFacial has quickly become one of our most popular treatments at our Exhale MedSpa at the Cosmetic Surgery Center, helping patients of all ages and skin types enjoy cleaner, brighter skin. Whether you have specific skin concerns or just want to give your skin a pick-me-up, we’re sure you will love HydraFacial too! Should I consider HydraFacial MD? 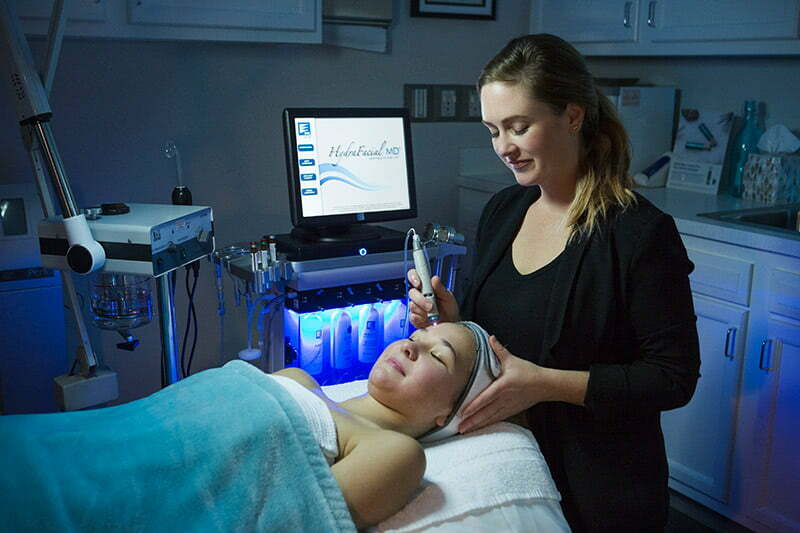 HydraFacial MD is a gentle, yet powerful skin treatment that is safe for almost all skin types. Since it uses water, rather than heat, abrasion, or harsh chemicals, patients find treatment to be very comfortable, even soothing or relaxing. No downtime is required, and many notice a difference in the way their skin looks and feels immediately after treatment. Even if you don’t have specific skin concerns, a HydraFacial can help give you an overall boost in skin clarity and brightness, making it a good treatment to help prep for a wedding or other special event. Vortex-Exfoliation. Exfoliates to get dead, dull cells out of the way. Vortex-Peel. An application of Glysal™ further removes dull, damaged outer skin layers. Vortex-Extraction. A gentle vacuum flushes out pores with a soothing, calming serum. Vortex-Boost. An blend of customized serums target your specific skin concerns. Vortex-Fusion. An infusion of anti-oxidant rich Antiox+ serum helps protect and refresh the skin. Perk is a new “add on” system that can enhance your HydraFacial or be used as a stand-alone treatment to nourish and refresh your skin. This skin treatment quickly, safely, and effectively exfoliates away dry, damaged, and dead skin cells to make room for healthy, glowing skin to shine through—all while delivering antioxidants and nutrients to your skin. Perk targets areas not treated by the original HydraFacial, such as the lips and around the eyes. Revive your face. Experience exfoliation and nourishment of your facial skin & enjoy a radiant glow! The cost of your HydraFacial will depend on the type of HydraFacial you choose and whether you include add-ons with your treatment. 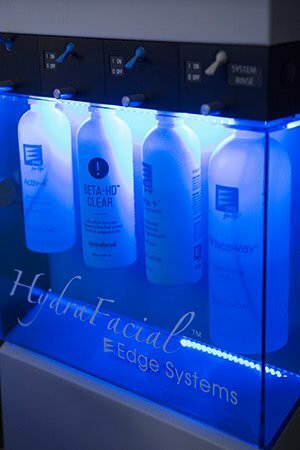 A HydraFacial takes about 30 minutes at our Exhale MedSpa, depending on the treatment area. No special preparation is needed on your part; just arrive at your appointment without make-up on. After discussing your treatment goals, our Medical Aesthetician will prepare the HydraFacial with the serums that will target your skin’s needs. During treatment, you will feel some pressure from the HydraFacial wand as it works to exfoliate, cleanse, and rehydrate your skin. There is no downtime after treatment; you can reapply make-up immediately afterwards and continue with your day. You may notice your skin looks brighter and feels refreshed right after a HydraFacial, and the hydrating effects can last about a week. Other improvements, such as a reduction in fine lines, hyperpigmentation, and congestion will appear more gradually and with follow-up treatments. Many patients are pleased with the effects of their first HydraFacial, but for lasting improvements in skin blemishes and congestion, we recommend receiving a series of treatments, spaced a few weeks apart. Our skincare team can help you develop a plan optimized to your needs. Ready to try HydraFacial MD? 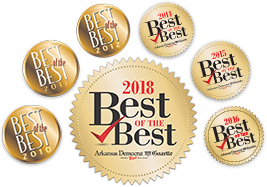 Book your appointment at Exhale MedSpa in Little Rock. Contact us to get started at a personal consultation. Our friendly, experienced aesthetician at Exhale MedSpa at the Cosmetic Surgery Center will evaluate your skin, answer your questions and discuss your goals, and help you understand what HydraFacial might achieve for your skin.